I am a self titled amateur artist. Maybe I shouldn’t call myself amateur though because most of my work shows rudimentary skill, but nevertheless, there are moments where I end up impressing myself and that’s what counts, right? Anyway, it’s been over a year when I sat down and wrote in my to-do-list that I had to go buy myself a sketch book, which I hadn’t. To make things more serious, I ended up writing “buy a sketchbook” for one of my 2016 resolutions! 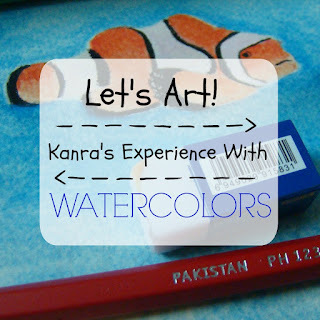 So this week, I finally went out to buy a sketch book and try being a little creative. My style of work is how I usually go, first I chose my art. For this trial page, I went through my instagram feed and picked the Georgia Aquarium post from the summer of 2015. 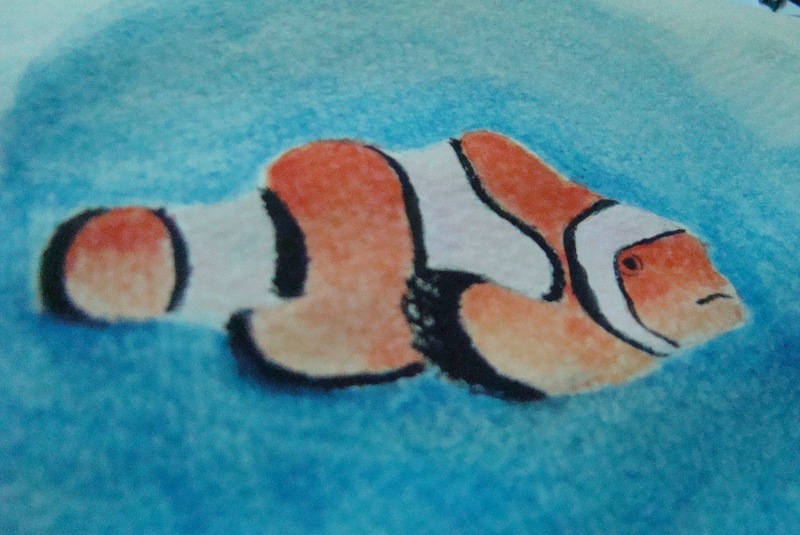 It was simple enough to draw a clown fish. 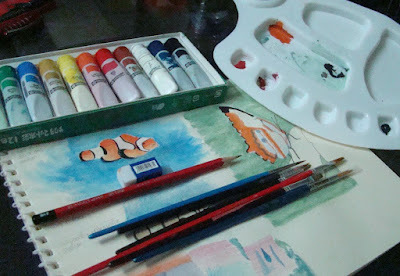 While I drew the clown fish, I also checked out a couple of water painting videos from Youtube. The most helpful video I found was this one, which talks about types of washes.So I applied the principles of the video to the clown fish. The technique I went for was gradated wash, which involves painting successive strokes down the wet area to create a fade effect. As you can probably see, it worked well for the orange (vermilion) but not that well for the blue. I also painted in the white stripes with white paint because the paper itself has a yellowish hue. Another thing to be noted is that I painted the clown fish first and the background later, so that could be the reason for the imperfection. Nevertheless, I am really proud of the orange effect. I tried to reproduce it, but it seems like I need more practice, half of my attempts of replication were not satisfactory. 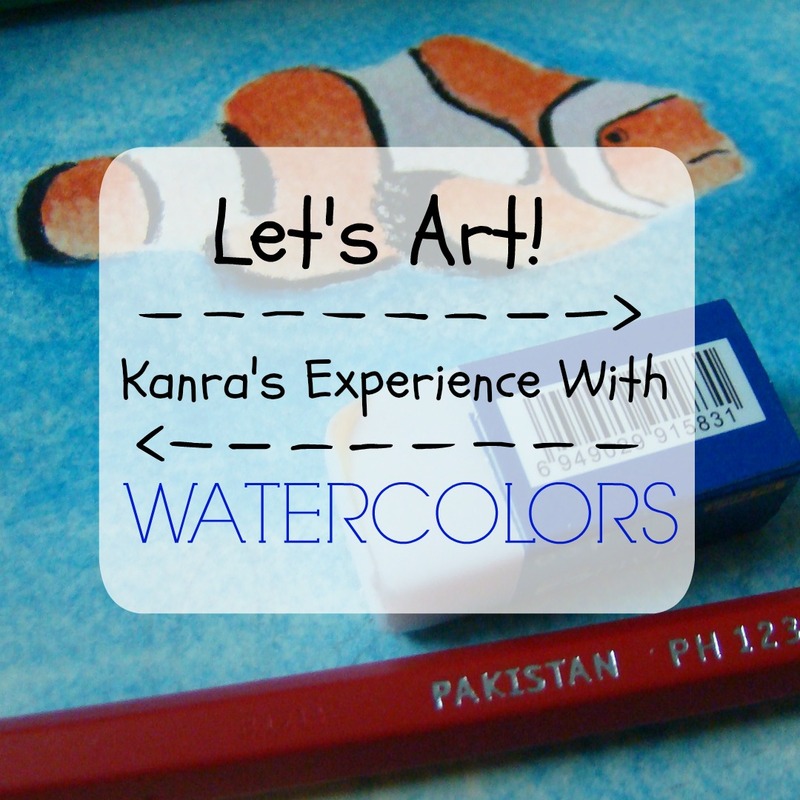 Are any of you interested in watercolors? If you’ve painted before and have tips for improvement or helpful tips in general, be sure to share! ‘Cause sharing is caring. 😀 Have a nice day! The pictures I used in this post were taken with my camera. It’s really old (8.1 megapixels) so if the pictures don’t seem very high quality as compared to the previous iPhone photographs, please let me know in the comments! Thank you! Posted in GeneralcommentLeave a Comment on Let’s Paint!